In the midst of yet another interminable argument between Jerry Ryan (Robert Mitchum) and Gittel Mosca (Shirley MacLaine), eventual live-in lovers, he makes an empty physical threat which understandably still prompts Gittel to scream. "Stop it," he says. "Somebody might come." "Nobody will come," she replies. "It's New York." That's partly a New York Joke, sure, but it also speaks to the higher truth of "Two for the Seesaw" - that is, these two characters often feel separated from the rest of the world and painfully self-involved. That it feels this way can likely be attributed to its roots in the stage. Directed by Robert Wise, it was adapted from a Broadway play written by William Gibson by Gibson himself and Isobel Lennart. There are a couple quality sequences, particularly an early one, when our two characters evoke punchers in the ring, sizing each other up before truly beginning to connect. Jerry, we learn, was a lawyer from Omaha who came to New York City following a painful separation from his wife (as Mr. McAllister of "Election" presciently put it: "For centuries people have come to New York seeking refuge from their troubled lives"). All alone, echoed in opening credit shots of him wandering an uninviting city, he turns to the first woman that speaks to him at a freethinking party where he does not belong. This Gittel is a wannabe dancer with an ulcer, too trusting of suspect men and too whimsically self-destructive. She would seem an odd match for the suit-and-tie favoring Jerry, and this is what they hash out in the film's best scene as what amounts to their "first date", each one pecking at the other to see if he or she will scratch back. The cross-examining lawyer in Jerry is on full-display but Gittel, neurosis aside, gives as good as she gets. She has a cynic's streak, yes, and this is precisely what allows her to sense Jerry is telling himself a few little white lies. Not that Jerry would ever admit it. Mitchum's vocal timbre has always suggested a charismatic know-it-all, which is perfect for a harsh noir but less appealing for a straight-laced romance. Here, he is less charismatic than merely a know-it-all. 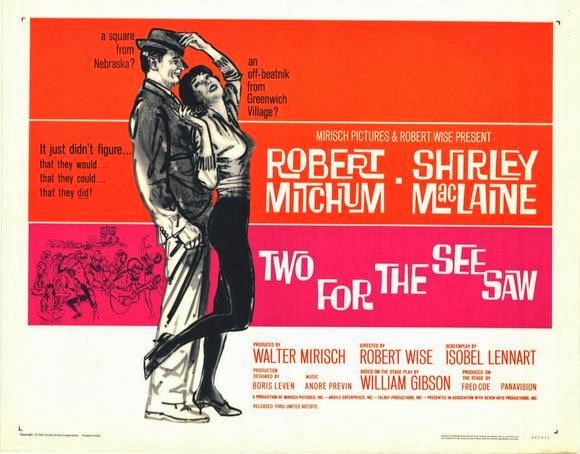 Seriously, "Two for the Seesaw"is intended as a love story, except that Jerry comes across much more as a parental figure or self-appointed mentor to Gittel. "Stop rushing to my rescue," she declares, but he pretends not to hear. He wants to fix her up, refine her, put her on a diet, sort out her life goals, as if she's a Greenwich Village Pygmalion minus the satirical notes. You can sense the possibility of satire. Being released in 1962 you can sense the Eisenhower and Kennedy Administrations running right up against each other in these characters, one on loan from 1950's Suburbia and the other representing 1960's Bohemia. To a degree, these two ideals do battle it out, particularly in the aforementioned "boxing" sequence, but somewhere along the line that gets entangled in an underlit courtship and scenes so stagy with dialogue so repetitive that you will begin clawing at the walls in a hopeless effort to go AWOL and run giddily through the city streets. If Jerry pushes Gittel to get a handle on her wayward existence then Gittel pushes Jerry to confront his past. He caves, rejecting her offhand marriage proposal, suggesting he knows what's best for her while finally figuring out what's best for himself. Maybe. Or maybe he just ultimately proved he couldn't hack it in the urban jungle. If you can't make it there.....wait, is that how it goes?